Penne with Smoked Duck Breast and Pumpkin in Cream Sauce - A recipe from Savor California, the online showcase for extraordinary gourmet foods and beverages from California. Toss pumpkin cubes with olive oil and kosher salt. Spread onto a cookie sheet lined with aluminum foil. Roast for 15-20 minutes, turning once or until barely fork tender. 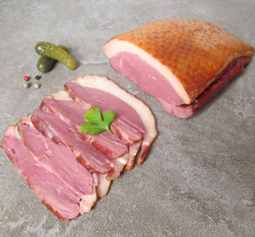 Trim fat from duck breast and cube. Meanwhile, melt butter in heavy medium skillet over medium heat. Add shallots and sage. Sauté until fragrant, about 1-1/2 minutes. Add wine and cream. Increase heat and boil until sauce is reduced to desired consistency, about 5 minutes. Season to taste with salt and pepper. Add penne, pumpkin and duck breast to white wine sauce. Toss to coat evenly. Pass shredded Parmsan cheese, if desired. * For a rich, earthy flavor, use Fabrique Délices truffle butter.